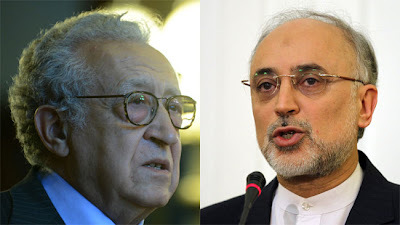 Iranian Foreign Minister Ali Akbar Salehi met with UN-Arab League Special Envoy to Syria Lakhdar Brahimi today in Cairo and discussed the latest proposals to end the civil war in the country. Salehi is in Cairo on a visit and has held talks with Egyptian President Mohamed Morsi and his Egyptian counterpart Kamal Amr. Salehi reportedly pointed to the “difficult and sensitive” situation in Syria and voiced Iran’s readiness to “cooperate and help settle” the crisis. Iran has been a staunch supporter of Syrian President Bashar al-Assad. Brahimi and Salehi called for the continuation of bilateral consultations in the future. THE Envoy has zero option except to adopt the Iranian and Syrian proposals.with His efforts reaching a dead end and the war turning in favor of ASSAD,the whole gang of murderers will have to eat a humble pie and leave SYRIA ALONE!. If the war is turning in "favor of ASSAD" then why is it Taftanaz a strategic military airbase in north-western Syria has been overrun and captured by the FSA?